IMO has released a story map series that covers the history of housing discrimination and civil rights in the Twin Cities. Historical persons and places are depicted on the 1934 Home Owners’ Loan Corporation map, which based its categories on race and was used to justify disinvesting in segregated minority communities. Over eighty years later, the patterns on this historic government-sanctioned ‘redlining’ map closely resemble today’s concentrations of communities of color in the cities of Minneapolis and Saint Paul, reflecting current inequality in terms of transportation, affordable housing and mortgage lending. The series calls attention to the history of white hostility towards racial minorities in the Twin Cities. It highlights local civil rights activism, that later gained national prominence, and demonstrates how past and current policies perpetuate segregated living patterns in the Twin Cities. November was a busy month for school diversity and civil rights news. In the interest of space, I had to leave out stories on a failed (and bizarre) white secession attempt near Atlanta, new research/reporting on “a la carte” living (or, when neighborhoods become more diverse, but schools do not), and Cindy Hyde-Smith and segregation academies. (I haven’t been able to bring myself to write about that last issue, but Noliwe Rooks has a great piece about it in the NY Times.) Meanwhile, I wish I had more space to write about the proposed revision to sexual assault investigations from the DeVos DOE, but these articles have good overviews on implications for K-12 and higher education. This will be a topic for a future post. Historically, affirmative action/integration opponents have used cases of white people denied admission to K-12 or high education to chip away at race-conscious policymaking. The Harvard and Hartford cases represent a new legal strategy: using non-white students/families as plaintiffs in cases that work against school diversity. The Harvard case is funded by Edward Blum, a wealthy white financier of anti-affirmative action efforts, most notably the recent Fischer case in Texas. He started SFFA as the vehicle for his anti-affirmative action campaign- the picture here is a screenshot from their homepage. Blum was also influential in the case that gutted the Voting Rights Act. Meanwhile, the Hartford plaintiffs are backed by the Pacific Legal Foundation, another long-time opponent of K-12 integration that was a major player in the 2007 Parents Involved case. Given the first point above, there’s a shared dynamic in both cases – wealthy, white folks capitalizing on understandable concerns from non-white groups to serve their larger political goals. Both lawsuits were filed in federal court, putting them on track for a potential SCOTUS ruling, which would likely lead to the worst for affirmative action/integration supporters. As I explain in part 2, the pipeline for the Hartford case is a little more complicated. Since I had a lot to say about each case, this post is split into two parts, with this one focusing on the Harvard case and a post tomorrow for Hartford. In each post, I use the new coverage to highlight a few key points, and I link to useful articles/resources for those who want to learn more about each case. On to the Harvard case! At issue: In addition traditional measures, Harvard uses criteria like participation in extracurriculars, volunteer work, legacy status and a “personal characteristics” rating (among other criteria). As reported in this very helpful Vox.com story, “internal data shows Asian-American applicants are rated lower on personal metrics, despite outperforming white applicants in other areas.” As a result, SFFA argues that Harvard is effectively using the personal characteristics rating as a sort of backdoor way of enforcing a racial quota. At stake: This case could ride the appeals process up to the Supreme Court, where the results (unlikely to be positive for integration advocates) would almost definitely apply to all publicly funded universities in the US, basically ending affirmative action as we know it. This article makes an interesting point – if SFFA loses the federal case, it will definitely appeal; but, if Harvard loses, it could decide not to appeal, thereby keeping it out of an inhospitable court. It isn’t just Harvard – there are similar cases at UCLA and the University of North Carolina. And, it isn’t even limited to court cases. Separate from the lawsuits, Harvard and Yale are also under investigation by the Department of Justice for their use of race in admissions policies. In the Harvard trial, there’s an understandable concern in that Asian American students disproportionately receive lower ratings in the “personal characteristics” category. But SFFA is using this important, yet relatively limited, issue to do something with far-reaching implications: end race-conscious admission across all publicly funded universities in the US. Again, you’ll see a similar theme in Hartford. Following reporting about Minnesota's 2018 general election, including postings on statewide races and state representative races, today the IMO blog continues its coverage, looking into voter turnout, which was historically high for a midterm election. Turnout rates were highest in the Twin Cities metro and for women across the state, together significantly helping Democrats gain victories in races across statewide offices. 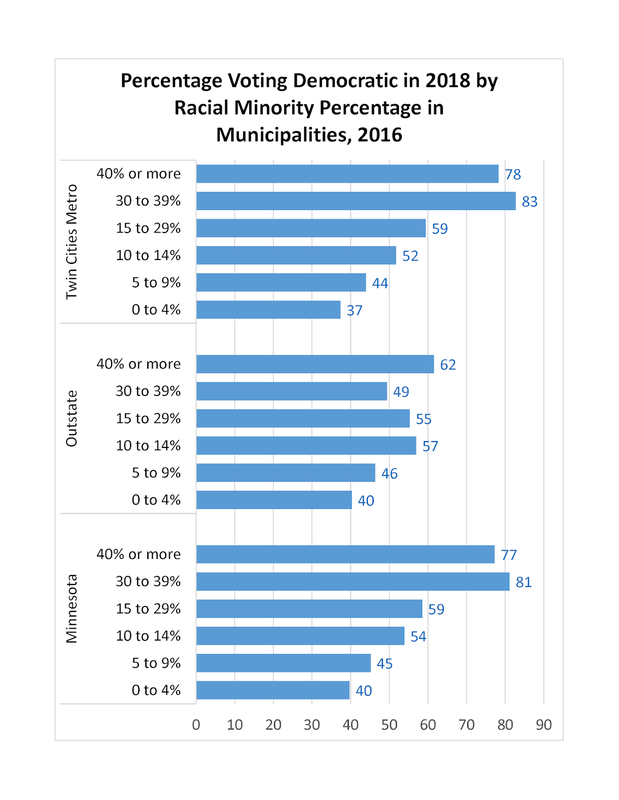 A common occurrence with election cycles is that the percentage of residents turning out to vote dips during midterm elections. 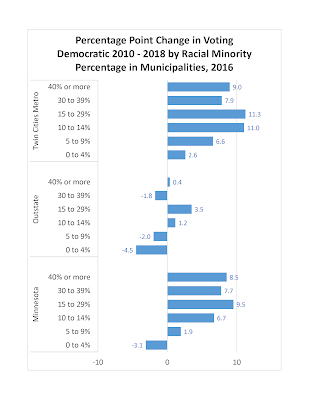 This decline in turnout, however, did not happen at the same level in the 2018 election, as it did in previous midterms in 2010 and 2014, as shown in the chart below. Places across Minnesota had higher turnout, with some locations outpacing others in gaining votes. 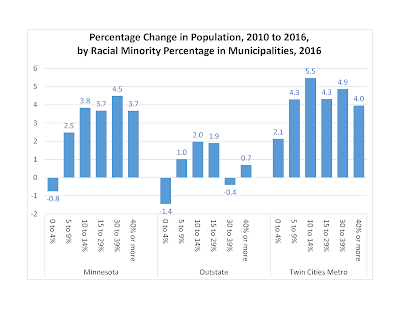 In 2018, the Twin Cities suburbs had the highest turnout rates in the state, nearly 65%, a rate much higher than in the prior two midterm elections. The combined cities of Minneapolis and Saint Paul had the next highest rate, about 58%, slightly surpassing the overall Outstate vote for the first time since 2008 when Obama first was elected as U.S. President. Turnout in Outstate Minnesota was much lower than in the Twin Cities suburbs, equally lower in both the cities of Duluth, Rochester and St. Cloud and in the remaining Outstate area. This was unlike the other midterm elections, when these central cities lagged the rest of Outstate by 5 to 10 percentage points. The turnout rate was calculated taking the total number of votes for president and total votes for governor (during the midterm) divided into the number of persons age 18 and over. 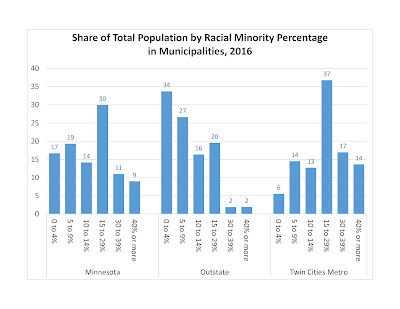 The Twin Cities suburbs includes municipalities from Anoka, Carver, Dakota, Hennepin, Ramsey, Scott Washington and Wright Counties, and does not include Chisago and Isanti Counties because their data was not reported in the sample data. 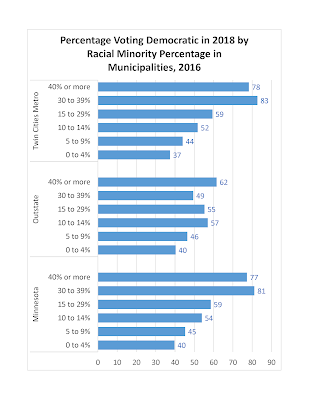 Data is from the Minnesota Secretary of State and U.S. Census Bureau, American Community Survey 1 year sample data. The chart below better shows the differences in the magnitude of change between 2018 and the prior two elections. 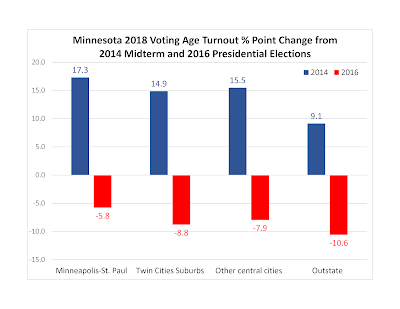 The cities of Minneapolis and St. Paul had the largest increase in voter turnout from the last midterm, an increase of 17.3 percentage points in the turnout rate from 2014. 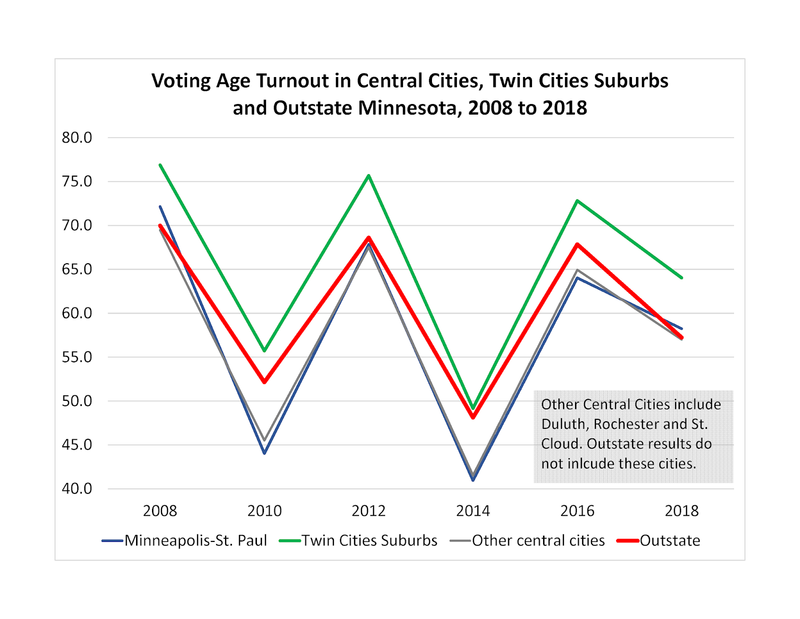 The Twin Cities suburbs and the other Outstate central cities also had double digit increases in the turnout rate, while the rest of Outstate Minnesota had a significant increase, but one that was comparably smaller than other locations--about half that of the cities of Minneapolis and St. Paul. 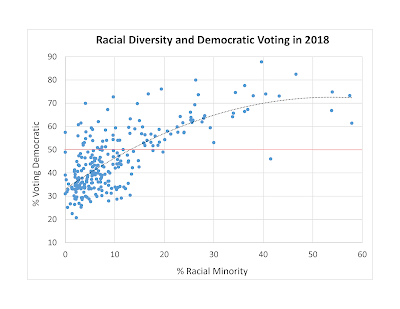 As is typical between a presidential and midterm election, turnout rates dropped between 2016 and 2018, but fell far less than usual, as shown on the chart above. 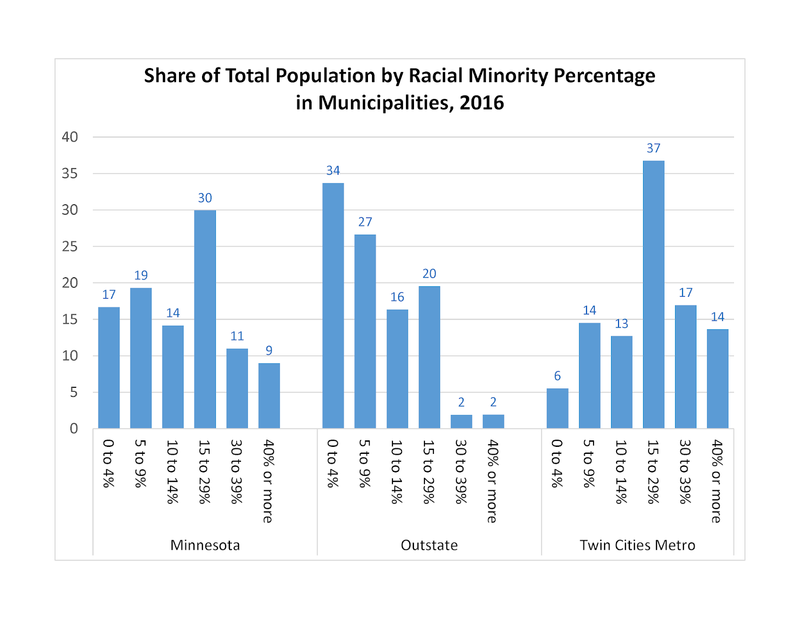 As shown on the chart below, the cities of Minneapolis and Saint Paul had the smallest drop off, only -5.8 points, followed by the Twin Cities suburbs (-8.8) and other central cities (-7.9). 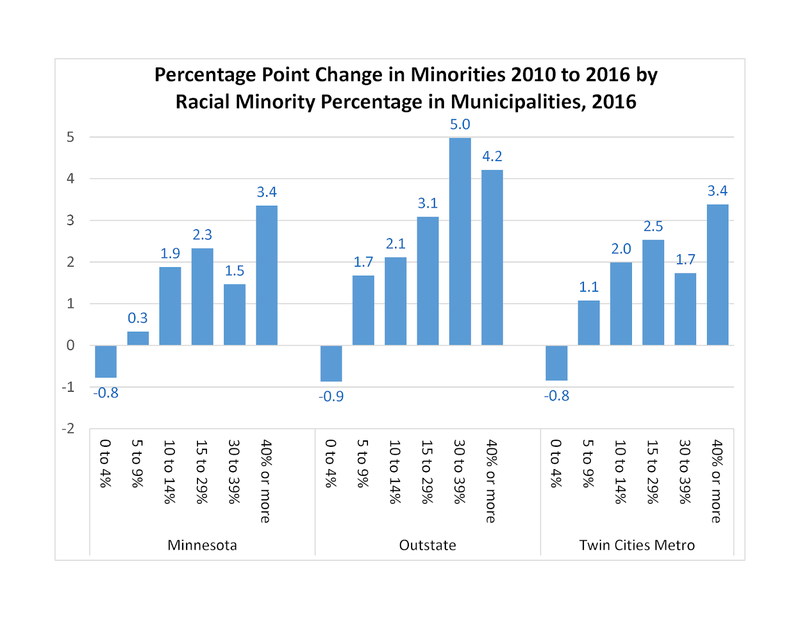 The drop in the turnout rate was largest in the non-central city portion of Outstate Minnesota (-10.6). 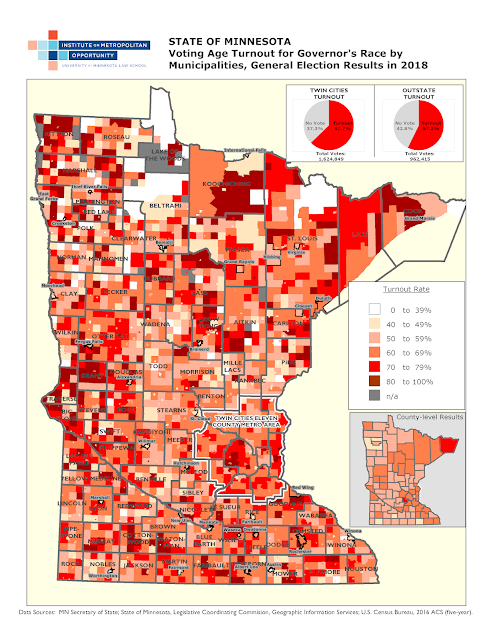 The map below shows the percentage of the voting age population that cast a ballot for governor in 2018 by Minnesota municipalities. Such turnout was high across the state with clusters of very high turnout (rates of 80 percent or more) scattered across the state. The county inset on the map shows that turnout was somewhat greater in Northeast, North Central, West and Southeast Minnesota. More important to the accumulation of votes, is the cluster of high turnout municipalities in the more populous 11-county Twin Cities metro area. 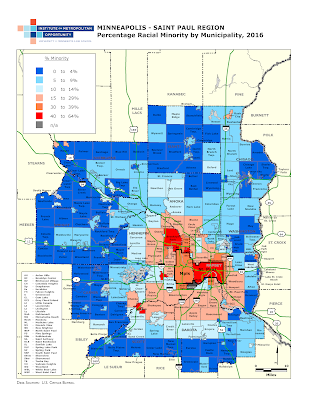 As shown on the map's charts, turnout was significantly higher in the Twin Cities (62.7%) than in Outstate Minnesota (57.2%). In the Twin Cities' metro, turnout was above average in most municipalities throughout the area, but was consistently high (rates of 70% or more) in outer ring suburbs near the edge of the built up urban area, except on the north edge of the metro. Many first and second ring suburbs also had high turnout rates, with first-ring Edina and Mendota Heights having rates in excess of 80%. 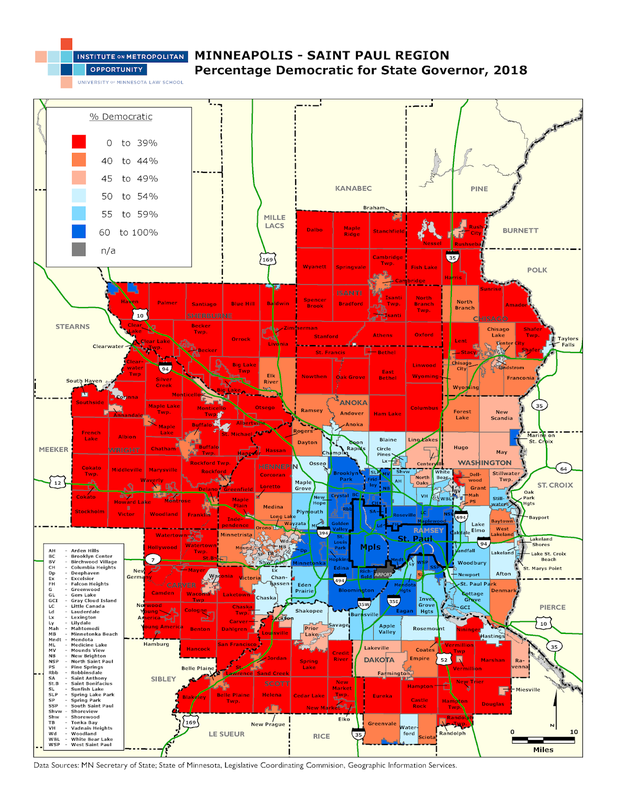 While Minneapolis' turnout rate was higher than average, and St. Paul's was lower than average, as shown on the map above, there are major differences in turnout when breaking the cities out by state legislative districts, as does the map below. Here turnout rates were high in more affluent districts in South Minneapolis and in Southwest St. Paul, but were lower in North and South Central (Phillips) Minneapolis, as well as in the North End and East Side of St. Paul, places with greater concentrations of racial minorities and poverty. 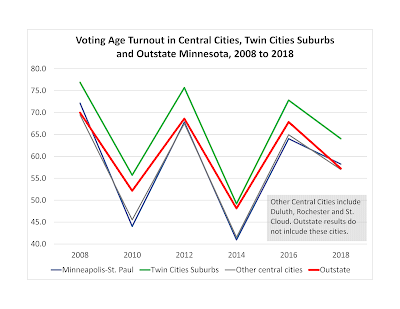 Turnout rates also tended to be lower in inner-ring suburbs adjacent to low turnout city districts, most notably Brooklyn Center. How much did turnout change the results of the 2018 Election? 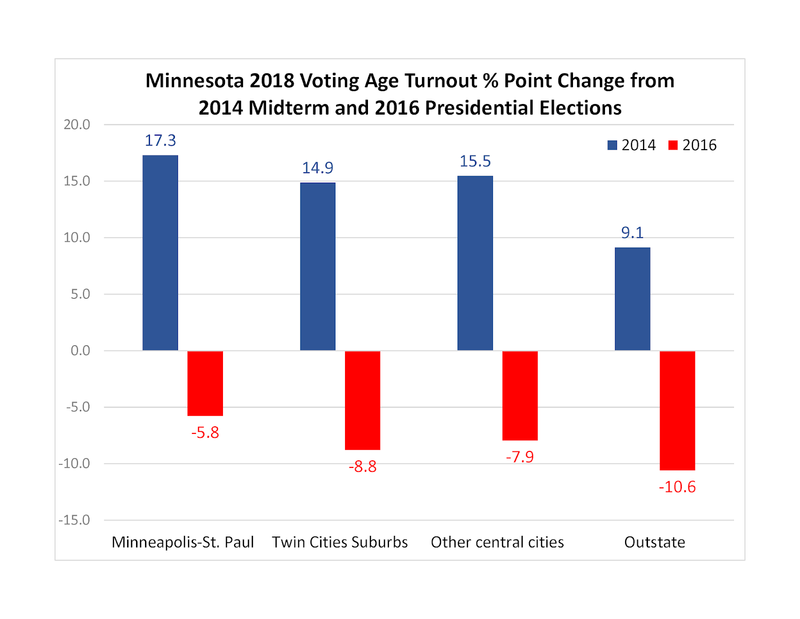 Changes in midterm voter turnout patterns (2014-2018) between Minnesota locations did benefit Democrats. Calculated from the data above, Democrats in statewide races gained 1 to 2 percentage points in the share of total votes, more than they would have if the 2014 turnout rates prevailed in 2018. 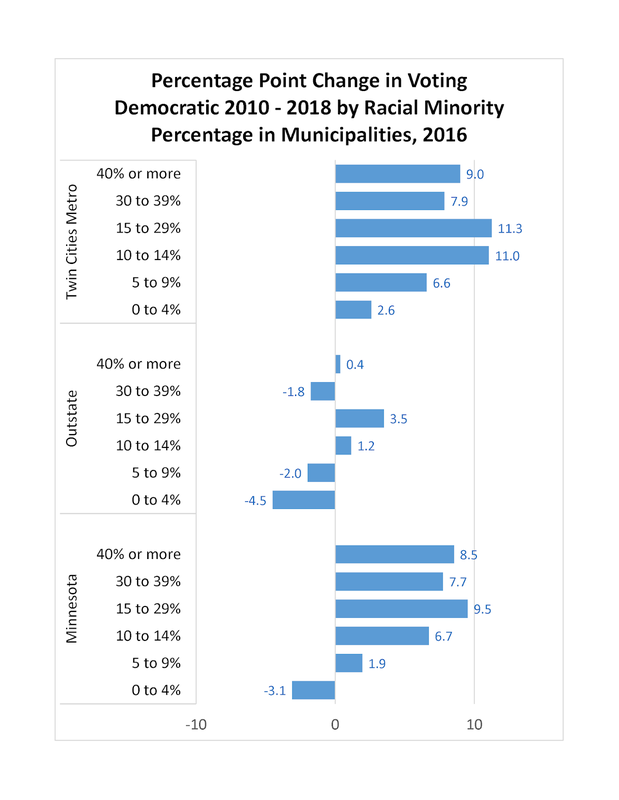 This figure is based on voters turning out across municipalities at the same rate as they did in 2014 and with shares of voting across parties kept the same as in 2018.
Who turned out to vote also impacted the election, and in this regard, women led the way in helping the Democrats gain victories, while demographics such as age and income had less of an impact in the statewide races. Democrats in statewide races gained around an additional percentage point of the total share of the vote, more than they would have if the total vote share for women remained the same as 2014's, and if women's vote share across parties in 2018 was held constant. 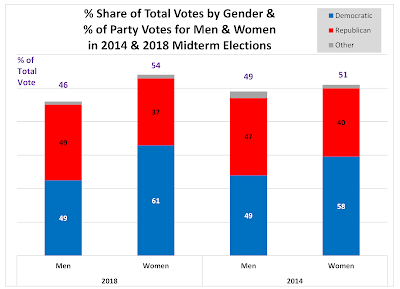 Data used to calculate the share of women voting comes from NBC exit polls for Minnesota in 2014 and 2018. The chart below shows the results for the U.S. Senate seat formerly held by Democrat Al Franken, and in it the percentage share of the total vote by gender (columns) and the percentage of votes for parties by men and women in the last two midterm elections (column sections). The share of of the total vote by women climbed from 51% in 2014 to 54% in 2018. Just as important, the share of women voting for Democrats rose from 58% to 61%. A large part of the gain was due to the increase of 'Independent' women voters who gained a 3 percentage point share of the total vote between 2014 and 2018, and whose Democratic voting percentage was 60%--a full 10 percentage points higher than it was in 2014. 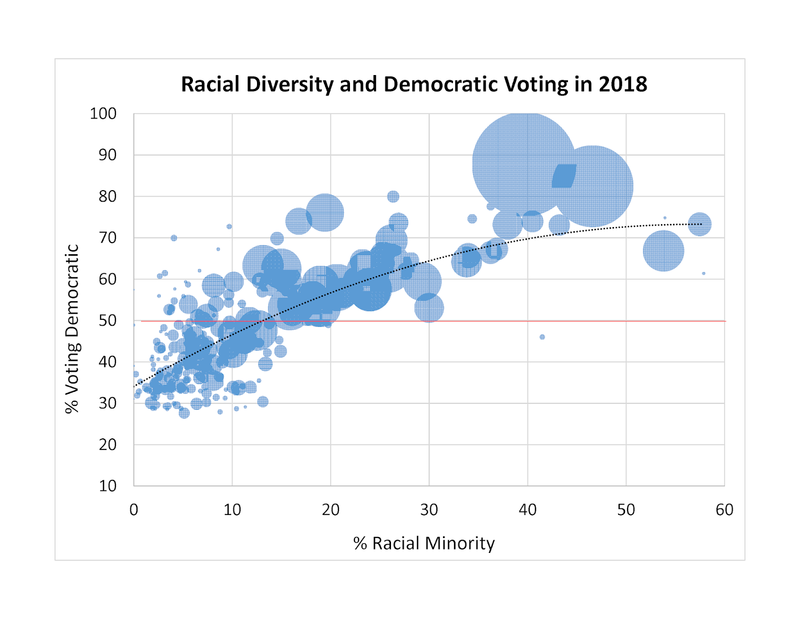 Similar demographic trends found in this U.S. Senate special election race can be found in the State Governor and U.S. Senate (Klobachar's seat) elections, with women increasing in the share of the total votes and increasingly voting Democratic. 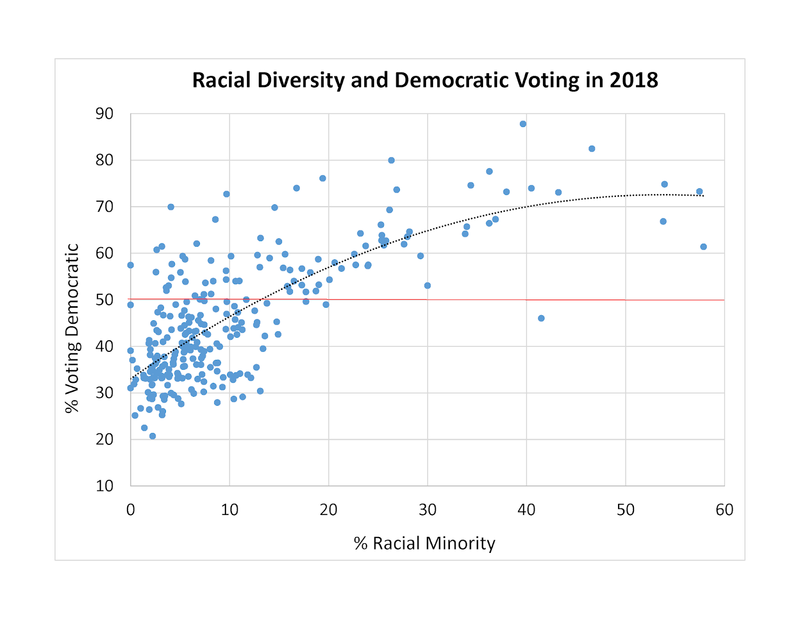 While changes in turnout between locations and genders helps explain roughly one-third of the Democratic margins of victory in 2018, it is notable that voters tended to more often cast ballots for Democrats in statewide elections than they did in the last midterm, regardless of their location or their demographic profiles.